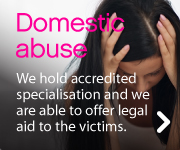 DS Legal is an experienced, highly regarded forward-looking law practice, specialising in family law. We are committed to offering a first-class service and we pride ourselves on our no-nonsense and practical approach. We provide clear and effective advice, whilst at the same time understanding just how difficult family breakdowns can be. We offer our clients professional and informed advice at every step. What can we help you with? My partner has left me... What is my financial entitlement on separation? How will I be able to fund my divorce? My partner is abusive what can I do? My partner won't let me see the children My ex partner wants custody of the children Am I entitled to Legal Aid? 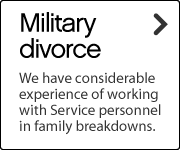 Social services are involved with my children I'm serving in the Military and need general advice How can I set up a pre-nuptial agreement? Family separation can be the most difficult experience you will ever have. 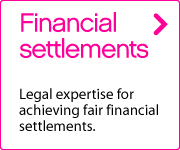 Here at DS Legal you will receive expert advice. 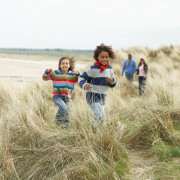 When things go wrong, it is important to get the best advice to make choices for your children and their welfare. Helping you to seek emergency protection for youself and your children. Following the breakdown in family life, safeguarding your home and assets will be our priority. 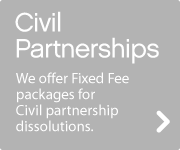 Whether embarking on a civil partnership or dissolving one, we have the expertise to help.